With the Genesis Turn It On Again 2007 World Tour now over, and no future plans yet for the band, fans of all varieties are left in a vacuum of sorts. Thankfully there’s the double-CD live album of the tour just released, and then the DVD of their Rome concert due out in February of next year. There’s also an incredible book spanning their entire career, giving you details to questions you never even thought to ask. And it’s not written by a fan, or someone in the music business, no, it’s written by the members of the band. Genesis Chapter and Verse is the autobiography fans have been waiting a long time to read: the Genesis story as told by Genesis. Arranged in chronological order spanning the band’s entire career from their early days as young boys at school to the reshaping of the band in 1970 with the addition of Phil Collins and Steve Hackett, to the leaving of Peter Gabriel and Steve Hackett, and then Phil Collins, and then the reforming for the Turn It On Again Tour; Genesis Chapter and Verse covers every piece of the band’s history. 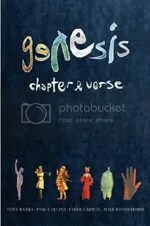 Printed in a large picture book form, it’s the ideal size for lots of colorful glossy pictures of Genesis through the decades. Along with the photos is the text: words and commentary from the current three main members – Tony Banks, Phil Collins, and Mike Rutherford – along with additions from Gabriel and Hackett, and the earlier Genesis members like Ant Phillips; each of these commentaries begins with the band member’s name, so you know who is saying what about when, and how multiple members saw the same event differently. Coupled with these are sidebars and interludes featuring different producers, managers, and the various drummers that Genesis had in their first five years, each telling their own unique story about this popular band. Genesis Chapter and Verse is the required gift for any fan, whether they be short- or long-time, who is unsure of where Genesis is going next: to distract them they can relive the band’s history through the band’s eyes and in the band’s words. It will leave the fan with a satisfied and happy feeling as they wait to find out what the future holds for one of the most important rock bands of the last four decades. Originally written on November 27th 2007 ©Alex C. Telander.